My kids call these “yummy bars”. I call them the perfect sweet and salty snack and just right for our ski trip. Made with only Real ingredients, these are worlds away from most store bought granola bars in both ingredients and taste. We brought these on our ski trip this week and they were just right for a quick burst of long lasting energy (and great for keeping my boys away from the Sugar Shack at the top of the mountain). Process dates in a food processor until finely chopped and they form a ball. Heat the peanut butter and honey on the stove until combined and heated through. Combine all ingredients in a bowl. Use a spoon to separate the dates so they’re evenly spaced throughout the mixture. Line a 9×13 pan with plastic wrap and evenly press mixture into pan. Cover with a second piece of plastic wrap and press firmly. Cut into about 10 bars. Keep in an airtight container for up to 5 days. They never last that long in my house! With four little boys in my house things can go from calm to crazy very quickly when they get hungry. Although I do love cooking and baking for them, every mama needs a break sometimes! It’s nice to have some Real Food snacks that I can quickly give them when hunger strikes. Below are my current top 5 faves. 1. Trader Joe’s Organic Popcorn with Olive Oil. $1.99/bag (about 5, 2 cup servings). 2. Original Triscuits. $2.50/box (about 9 servings). 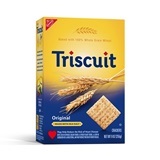 Before we started eating real food I think the last time I had a Triscuit was when my mother would serve them to her bridge club when I was little. I was so glad to re-discover these little treats! They’re perfectly sized and sturdy enough to top with all kinds of yummy things. And only 3 ingredients: whole grain, wheat, soybean oil, sea salt. If you’ve ever read the ingredients label on most granola you’ve noticed that it’s really hard to find one that’s made without sugar. Thank goodness for GrandyOats granola! 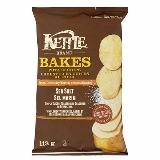 They bake this delicious, crunchy, lightly sweetened snack using natural (like honey and maple syrup) and organic ingredients in their bakery in Maine. My kids love it as a cereal in the morning or to add a sweet crunch to yogurt. You can also make cookies with it! I love the taste and also that they’ll deliver it to my door when I order it through their website, www.granyoats.com. When we first started eating Real Food I discovered the amazing ingredient of dates. I had actually never even eaten one before, but now love how they make it possible to have naturally sweet snacks and desserts. Larabar uses these perfect little fruits to create their delicious bars. By combining them with just a few other ingredients (like fruit, nuts, coconut, etc.) they’ve come up with a variety of flavors. My kids think they’re getting a “special treat” when I give them one of these. Last on the list, but my first choice for a snack! I could not believe I was eating a baked chip when I bit into these. They taste just like traditional chips but are “toasted” instead of fried. Absolutely delicious and only 3 ingredients: potatoes, sunflower oil and sea salt. I am so excited that potato chips can now be a part of our real food diet! I’m always on the hunt at the store for more Real Food snacks. Please let me know if you find any more! 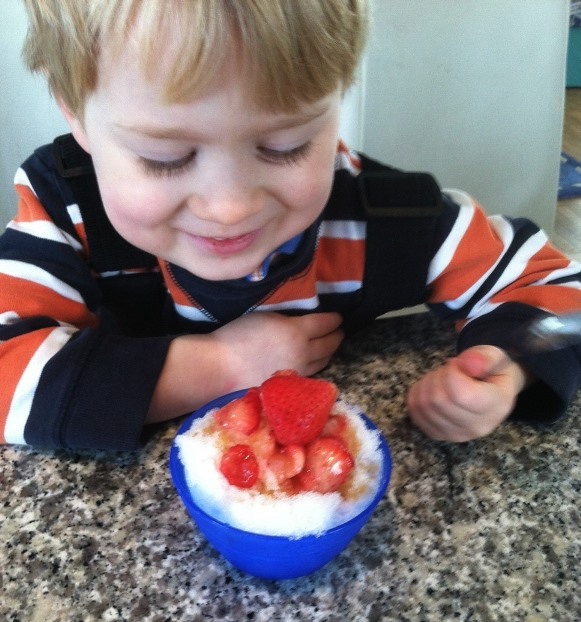 A purely natural sweet treat — a snow sundae! The kids were SO excited when I made them these snow sundaes today. It doesn’t get any easier, or more delicious! There’s just something so perfect about pure maple syrup combined with fresh snow. We’ve had so much snow this year that “snow days” have now become “snack days” in our house. If they can’t be at school, at least they can have fun at home learning to cook and make their favorite snacks. This one has quickly become a favorite in our house. It tastes great and the kids love anything they can dip food in and eat with their fingers! Here, Brody (age 5) and Liam (age 4) show us how to make Avocado Hummus. This morning we woke up late and rushed around trying to get lunches, snacks, and Valentine’s Day class treats and cards into the kids’ hands as we rushed out the door to school. On our way to the car my neighbor called out that there was a 2 hour delay…Ah! 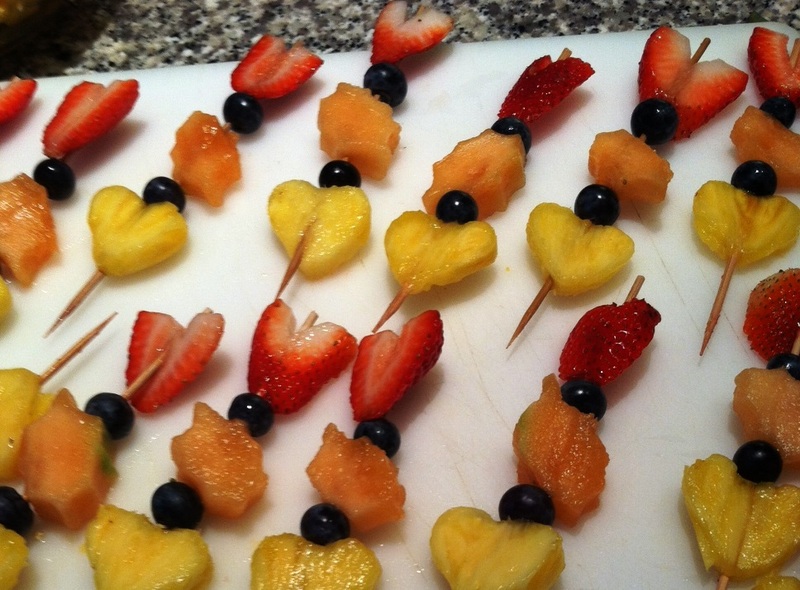 Junk Free Valentine’s Day Fruit Kabobs!